Railpictures.ca - Doug Page Photo: CP 5008 leads another GP35 and an RS3 off of the single track west of “the Junction” into the double track-ABS section of the Galt sub. 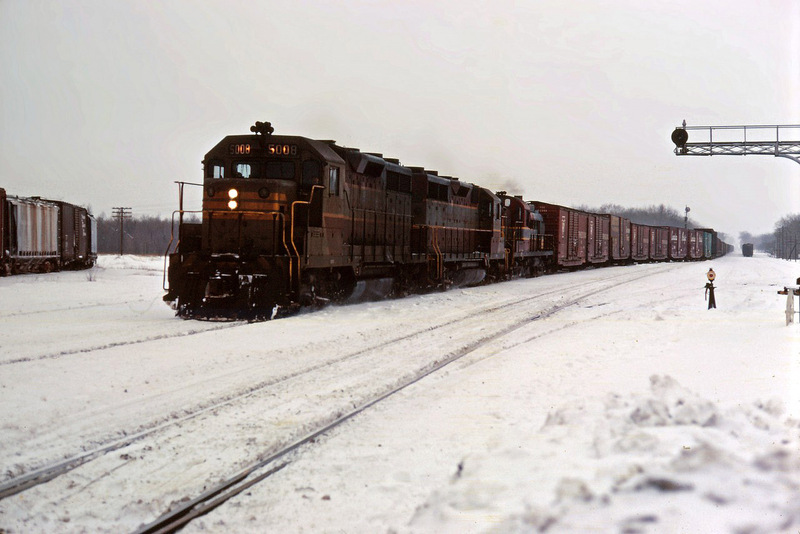 At the time, the Galt sub was dispatched by timetable and train orders; this is a scheduled train found in the timetable since is is not “displaying signals” | Railpictures.ca – Canadian Railway Photography – photographie ferroviaire Canadienne. Caption: CP 5008 leads another GP35 and an RS3 off of the single track west of "the Junction" into the double track-ABS section of the Galt sub. At the time, the Galt sub was dispatched by timetable and train orders; this is a scheduled train found in the timetable since is is not "displaying signals"
And some of those nice 60′ Pullman Standard CP “International of Maine” auto parts boxcars with the large script logos! (They all seemed to get painted out early on, perhaps when CP switched the reporting marks on them to CPAA).